Super Hero Building Block Kits (Spider-man, Superman + more) Just $6.99 (Reg. $14.99)! You are here: Home / Great Deals / Super Hero Building Block Kits (Spider-man, Superman + more) Just $6.99 (Reg. $14.99)! 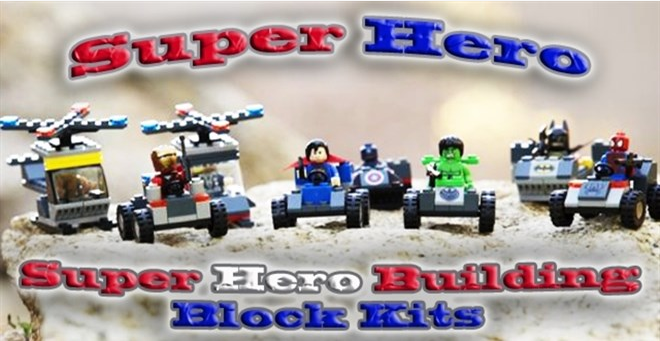 Your mini super hero will love these kits! Right now, grab one of these Super Hero Building Block Kits (Spider-man, Superman + more) for just $6.99 each (Reg. $14.99)! Shipping is only $3.99. Find this deal by going here and then do ctrl+f and type in “Super Hero” to take you to the exact deal page. Let there imaginations run wild, fighting crime and taking on the bad guys. Choose from 8 different heroes and each one comes with his own hero mobile!